Is there some (preferably free) online and accurate IQ test? One which does not give me an genius IQ and then tries to sell me a diploma. I need one which measures upto 160 sd15 (or higher). Such a test would probably document its norming process somehow. (1) Any IQ test has a maximum difficulty. That means that all subjects above a certain intelligence answer all questions correctly and get the same maximum score. This is called the "ceiling effect". Now you might say, that we simply need to construct a test that is difficult enough for even the most intelligent person to make some mistakes. (2) The problem with special "high IQ" tests is that you cannot draw a large enough sample to norm this test. An IQ score is not an absolute value, like height, where you measure from a zero point to a certain length and each length has a meaning in itself in relation to that zero point. IQ does not have a zero point (there is no measurable total absence of intelligence), and the values of an IQ test are defined in relation to the average intelligence of the population that person comes from. To norm a test, it is applied to a large sample of the population, and the mean and the shape of the distribution are calculated. The mean is defined as 100, the distribution is defined by the standard deviation, which for an IQ test is 15. The norming is done for different countries and at different times. This also means, that you cannot compare an IQ score from France to one from Spain, and that you cannot compare an IQ score from 1950 to one from 2007, at least not without some mathematical trickery similar to calculating the temperature in Centigrade from one given in Fahrenheit. Finally, you wouldn't know how the scores from this test relate to scores from other tests. In an IQ test with which you test the whole population, the average is set to be 100. Since all different IQ tests are normed for the whole population, you can set all their means at 100 and compare their scores. For a test that tests only a non-average subset of the population, like very intelligent people, the average must be somewhere else, because of course highly intelligent people are not of average intelligence. But where do you set it in relation to the 100 of the average population? You would need their scores from a normal IQ test to calculate this, but (now the circle closes) since a normal IQ test cannot measure them due to the ceiling effect, you don't know where they are in relation to the average IQ of 100. While you can create an intelligence test to measure the intelligence of highly intelligent people, this test will not give you a result that has any meaning in relation to the IQ, so in fact it is not an IQ test. IQ is not intelligence (a trait), but a construct. IQ is what is measured by an IQ test, as the saying goes. A high intelligence test measures a different construct. What you are asking for does not really exist, no serious IQ test would ever give a score of 160. IQ scores get swamped with noise more than ~30 points from the mean. For example, an IQ of 160 means you are are more intelligent than 99.996% percent of people while an IQ of 150 means you are more intelligent than 99.957% of people. No test could claim to measure that difference with a strait face. To add to the existing answers (of which @what's gets special mention), an issue I don't think has really been addressed is the statistical reason for it being so difficult to measure extremely high IQs. By design, IQ is scaled so that it's normally distributed, with a mean of 100, and a standard deviation (SD) of 15. A well known feature of the normal distribution is that 68% of values are within one SD of the mean, 95% within 2, and 99.75 within 3. This means that only .03% of IQ scores are more than 3 SDs from the mean: above $100 + 15*3 = 145$, or below $100 - 15*3 = 55$. It's even more unusual to find values over 160 (4 SDs) or under 40, with 99.993% of IQs being within this range. This means that only .0035% of people are likely to have IQs over 160. If you normed your IQ test on a sample of 1 million people (which is obviously totally unrealistic), you would only find ~30 with a 160+ IQ, rendering it impossible to accurately estimate a single individuals IQ in that range. 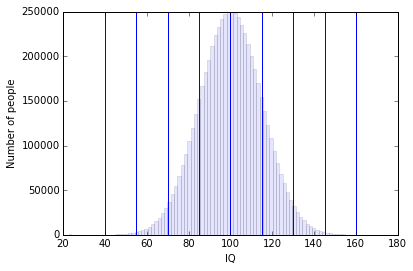 Simulated distribution of IQ for a population of 7 million (1/1000 the global population). Vertical lines indicate standard deviations (15 points). In this simulation, 238 people have IQs > 160. Giga Society, which describe many high-range IQ-tests in different languages. All others also have references to test (some of it is online). The oldest and largest high IQ society in the world is Mensa. They offer membership only to those who have an IQ in the top 2%. They administer their own test to qualify those who seek membership. There are also online IQ tests that claim to be Mensa IQ tests, but I am unsure of their validity. However, Mensa only recognize the results of tests that they personally supervise, so any online IQ test proclaiming you a genius is just a novelty really, as online IQ tests are not recognized as having any special significance by any 3rd party. If you are really serious about knowing how your IQ compares, I would suggest getting in contact with Mensa since they are the experts about that. Not the answer you're looking for? Browse other questions tagged cognitive-psychology intelligence test or ask your own question. Beyond a certain level, is reading comprehension affected more by psychological intuition than by verbal intelligence?